Some of the best accessories you will ever own you will find in the beauty hall or beauty aisle of your local pharmacy. These nifty products make your life easier when it comes to tanning and haircare. Over the coming weeks I will be looking at the tools of the trade that are imperative to have in your beauty arsenal but first let’s look at the tanning hacks that I have recently discovered. 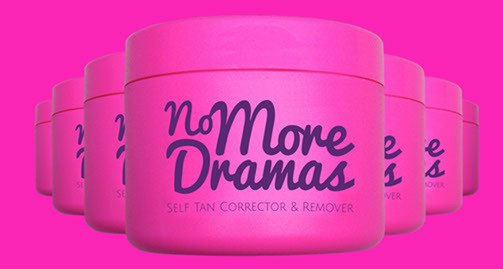 No More Drama is a tan remover that whips off the most stubborn tan. This pink tub of witchcraft will fix streaks and help remove old tan so you can start afresh. It smells fabulous and gives a smooth finish to reapply the new tan. I found it excellent when I had a few nights out in the one week and my tan needed to look fresh. It is available in Caci Beauty salon in Douglas and is priced at €12.95 per tub. St Tropez are the most well-known veterans of tan and they have a handy little fabric mitt to help with tanning mistakes. I find this useful especially when using instant or wash off tan. 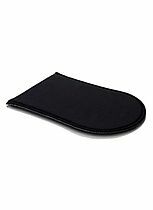 It’s a black mitt that removes residue without affecting the tan itself. It is for all intents and purposes like a tea towel to mop up any excess. It stops the excess tan from creating streaks and because there is so little product on it, which helps to give an even tan. It retails at €7.99 from Boots. And finally a few tanning tips for the guys and gals that are tanimals. Make sure you exfoliate the day before. Once you tan your hands and feet apply a little hand cream as these areas can be drier than other parts of your body and so absorb the tan differently causing streaks and white bits. The body lotion won’t affect the look of the tan it will only make it more even.